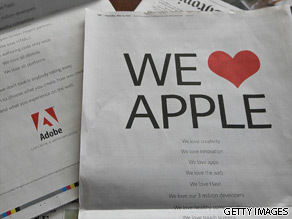 Dozens of newspapers and tech websites around the world had large spread advertisements from tech giant Adobe, saying that they "love Apple", despite being locked in a bitter dispute with the company. Does the battle between Adobe and Apple impact you? Ads appeared in publications including the "Wall Street Journal" and "Financial Times" and was a play on words of the popular slogan "I love New York" - but instead this time it read "We love Apple". The two companies have been in a bitter war against each other as Apple refuses to use Adobe's flash player software on its iPod and iPad platforms. In a blog last month, Apple CEO, Steve Jobs wrote that "letting a third-party layer of software come between the platform and the developer ultimately results in sub-standard apps and hinders the enhancement and progress of the platform." He also said the format leads to crashes, hinders app development and doesn't work well with touch-screen devices. Adobe has argued against the move by Apple and has said in an open letter to the public that the internet should "be open to everyone". "We believe that consumers should be able to freely access their favorite content and applications, regardless of what computer they have, what browser they like, or what device suits their needs," co-founders of Adobe Chuck Geschke and John Warnock wrote. Is it fair that Apple doesn't include Adobe flash as an option on their platforms? Should it be open to everyone?